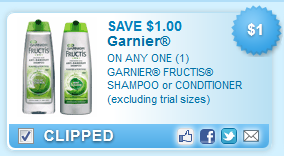 The regular price of GARNIER Fructis Triple Nutrition Shampoo is $2.96 at Walmart. If you find a sale, you could save even more! You can usually print each coupon twice per computer! Print quickly - they may go fast! Grab another coupon while you still can!